Opaque projectors are the ancestor of the more modern overhead projector and essentially a camera obscura used backwards. The basic idea is instead of having a dark chamber where an image from outside can be projected, have a very bright chamber in a dimly lit room so the light reflected off of whatever is under the projector can be directed through a mirror and lens to be projected into the room. As opaque projectors use reflected light off a piece of paper verses light transmitted through a film as in overhead projectors they are inherently less efficient at the paper absorbs some of the light. They are however optically simpler and able to project the image of any flat surface they are set on. So you can draw something or just pick it up place it under the projector and it will work, no transparencies necessary. We've come up with this bare bones cardboard box model so you can experiment with what is now a somewhat rare and fairly specialized piece of equipment. Start by marking the center of one side of the box by making an x from the corners. Center your 3'' cardboard tube over the x and trace it to mark the location where the lens barrel will be mounted. Fold up the box and tape the seams with duct or gaffers tape, to prevent light leaks. Hot glue the top flaps together from the inside and then fold the bottom flaps inside the box and hot glue them in place to reenforce the box. Cut a 5''x5'' square of foam core, center and trace a 3'' lens barrel tube. This collar will reenforce the lens barrel hole in order to hold the barrel straight. Cut out the lens barrel hole with a utility knife. Hot glue the lens barrel hole collar over the hole in the box using the lens barrel to align the collar. The attached collar should look like this. 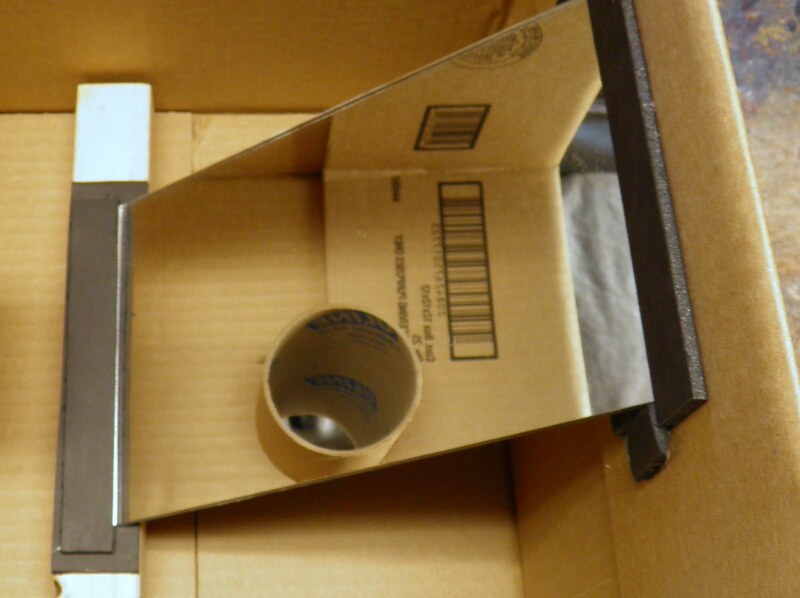 The mirror is at 45 degrees and moved down 1.75'' from the top of the box. To secure the mirror we used a strip of foam core directly above and below the mirror to trap it in place without glueing it. We add 2 small pieces of foam core on the side of the mirror to keep it from slipping from side to side. We used 3 pieces of foam core spaced about 1.5'' from the end barrel to hold the lens up. To get the spacing even we used a 1.5'' piece of foam core to measure from the top of the tube to the top of the lens holders before glueing them in place. After the lower lens holders are secured, place the lens on top and then glue three more spacers over it to pin the lens in place. We cut 2 light ports in the upper front corners using the lens barrel as a template. As the light ports are on the same side of the lens barrel, no light will be able to make it directly into the lens from the light sources placed in the ports so they will not interfere with the image. Here's the camera with the lens barrel inserted looking from the bottom. Note that the lens is mounted on inside of the box (close to the mirror), not on the outside as in the tracing camera. Here is the projector, a book and two light sources we tested. Here's the image the image the projector produces using a 20w warm white compact florescent held in the light port. Optimally using two 23 watt cool white compact florescents would produce the brightest image. Using a clip light socket with a foamcore or cardboard ring around the socket you can hang the lights in the projector box. Painting the inside of the box white next to the light sources or covering the walls with aluminum foil might improve brightness as it would the lower the amount of light the inside of the box would absorb. Note that using incandescent is not recommended given they run hot and might pose a fire hazard. Here is the far dimmer image the projector produced using a cheap flashlight. Using 2 higher powered flashlights you could expect to get a more usable image, but it would still be weaker and smaller than the compact florescents. Have you tried using the following? Am planning to try them out myself! We have not used either a fresnel lens or lcd lamps. Let us know how it turns out for you. I'm so glad I found this post. I just knew I could put something like this together and had all the components (used a dollar store magnifying glass instead of the fresnel lens) but was really struggling. It turns out your lens in the tube was the difference for me. Too much light was getting to the lens. I added the tube and am so excited to have my own version of this terrific opaque projector. I managed to do mine with a piece of foam core board, a magnifying lens, and a cosmetic mirror all from the dollar store then a light fixture from Ikea that I had on hand, a CFL and a piece of cardboard I pulled from the recycle bin that I then rolled around my lens to create the tube. I appreciate the help!! I'm sure I'll be blogging about mine (especially if I make a wood one) and will be sure to link back to this post to give you credit for the final guidance. thanks for the comment. let us know how the wooden projector turns out. What are you using the projector for?